San Mateo, CA, November 17, 2016 – The September recall of the Samsung Galaxy 7 appears to be diminishing interest across numerous Samsung products, according to new data just released by ShopRunner. The recall became official on September 1, when Samsung issued a voluntary recall of the Galaxy Note 7 due to a faulty battery that could explode. Samsung Electronics, Ltd. is a multinational conglomerate company headquartered in Seoul, South Korea. Samsung markets a broad range of digital consumer electronics, IT and home appliance products, including HDTs, home theater systems, digital imaging products, notebooks, PCs, tablets, refrigerators and washing machines. Overall, interest in Samsung products has decreased by 40% since its peak in August, prior to the recall. 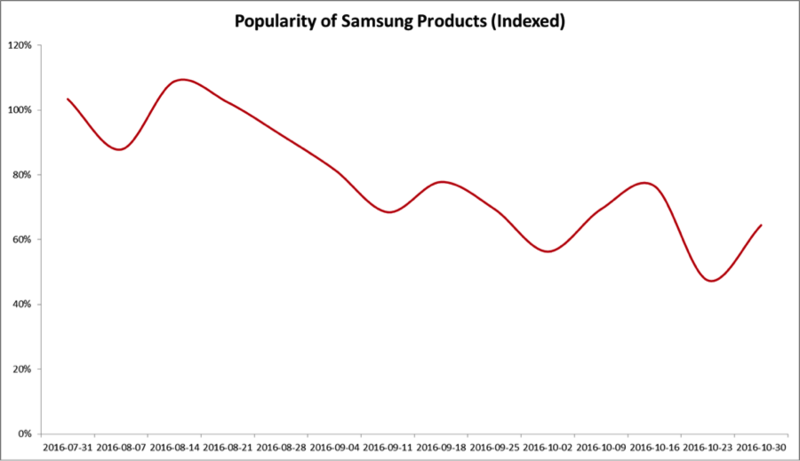 The Samsung Galaxy line of products specifically has been hit almost twice as hard with a decrease in interest of 74% since August, amounting to only ¼ of the brand?s pre-recall popularity. ShopRunner collected the data based on consumer interest from six retailers carrying a range of Samsung products, everything from cases and accessories to laptops, TVs and tablets.